Hi guys, welcome to Day 5 of the NAGG challenge. 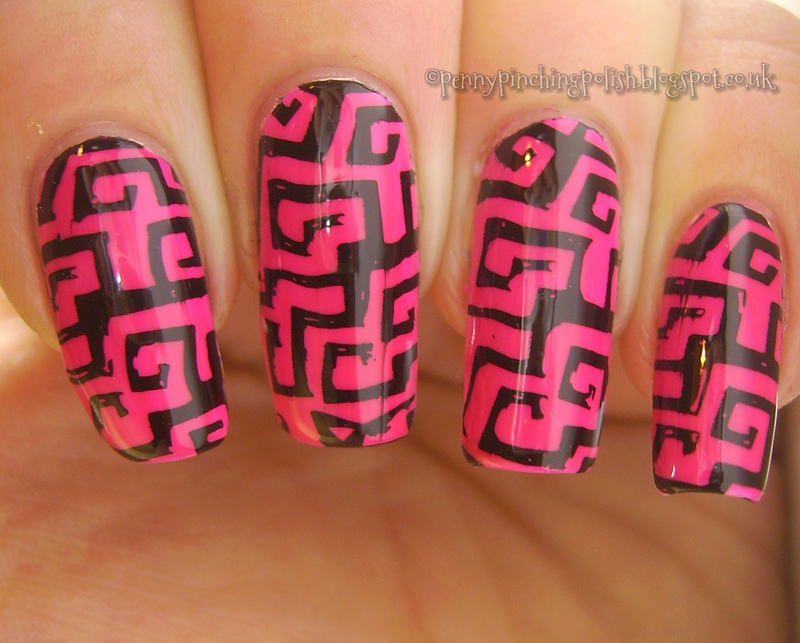 Today's prompt is Contrast, and I decided on some bold black stamping over a neon pink base. The base is Raspberry Rush by Color Club, over a white base to help the neon really pop, and the stamping is Konad Black and the evil tree branches from MoYou London Fairytale 01. This was another simple mani, but I wanted the colours to be the main focus of this design anyway so I think it's for the best. I will have something a little more complicated for tomorrows post though, and not a stamp in sight! I love this colour combo so much that I often have my hair in these 2 colours too, so as you can imagine, I was very fond of this mani. A little annoyed about the smudging on the pinky nail, I seem to be getting a lot of that recently. I think I should thin out my Seche a little bit more, and be a little more patient next time.